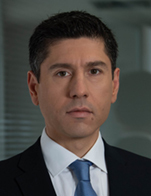 Dr Tasos Anastasatos is Group Chief Economist of Eurobank, Chairman of the Scientific Council of the Hellenic Bank Association, and Research Associate of the University of Piraeus. Previously, he has served as Secretary General of the Hellenic Ministry of Finance and Chairman of the Council of Economic Experts (SOE), EuroWorking Group Member for Greece; Visiting Member of Staff, Athens University of Economics & Business; Economist, Bank of Greece; Lecturer, Loughborough University. He holds a Ph.D. from the University of Warwick, an M.Sc. (Warwick) in Economics and Finance and a B.Sc. in International and European Economic Studies from the Athens University of Economics and Business. Dr. Anastasatos has published extensively in market research publications, academic journals and the media in the areas of macroeconomics, financial economics and the Greek economy; he has co-authored three books.